EDITORIAL NOTE: What follows is a condensed version of Chapter 1 of Goldstein’s book, published by the American Bar Association, titled Consumer Guide to Obtaining a Patent. In simple terms: a patent is a grant of rights by the government, for a limited time, that can be used to stop others from making, using, or selling your invention. Here’s where we can begin separating myth from reality: having a patent does not give you the right to legally make your invention! Said differently, having a patent is not a requirement for you to make or sell your invention! What a patent can do, however, is give you the right to stop others from making, using, or selling it without your permission. Now that this is clear, we can take a look at whether the ability of a patent to stop others from making, using, or selling your invention is important enough to your goals to justify your decision to patent it. Knowing your reason can help you decide whether it is worth the time, money, and effort to seek a patent. It can also help you and your attorney pick the right strategy in the beginning of the process, as well as make appropriate decisions along the way. Let’s consider the merits of each of these common reasons. As we take a closer look, some of them are more compelling than others. When people talk about diet or exercise, they generally talk about “healthy choices” and “unhealthy choices” (rather than “good” and “bad”). So let’s talk about these reasons in that way. As an entrepreneur, for your business, some of these reasons are “healthier” than others. Let’s just say a few of them are somewhat unhealthy—and at least one of them is dead wrong! Immediately after realizing “I have an idea,” nearly every inventor thinks, “But I don’t want anyone to steal it!” With the notion that patenting is the way to stop other people from stealing ideas, many inventors quickly decide: I need a patent. Ultimately, there’s nothing wrong with seeking a patent to avoid the devastating experience of knowing your idea was stolen. It’s helpful, however, to know whether that’s your primary motivation. Knowing your motivations gives you more choice in the matter—and then at least you’ll be clear about what you’re paying for! A frequent strategy for profiting from an invention is to find a company that will manufacture, market, and distribute the product, and pay the inventor a royalty. This highly sought-after arrangement is called licensing. If your prime reason for seeking a patent is to license it, there are a few things you should consider. First, you must be the one to find a company that wants it and is willing to pay you for your idea. In particular, you will need to find the right person at the right company—a person who appreciates the value of what you have created and is in a position to manufacture, market, and distribute it. Finding this person will require that you knock on some doors. Before pursuing a patent with the sole intention that you will license it, ask yourself: are you prepared to spend time knocking on doors to find someone willing to license it? As an entrepreneur launching a new product, you want to sell as many units of your product as you can. Clearly, your efforts can be slowed by others competing for the same customers. Preventing or reducing that competition could make selling your product a lot easier. One of the great benefits of even just applying for a patent is the uncertainty that it creates for your competition. When it’s not clear whether they can safely copy your product—because they don’t know exactly what’s in your patent application—they are less likely to make the risky decision to copy it. Similar in concept to preventing or reducing competition, a patent on an important feature can be your foot in the door in a very competitive market. It can also be the reason why a winning product remains relevant in the marketplace. The key is to patent the feature or features that make a difference and provide a solution to a widespread problem. Providing such a solution makes a product highly desirable in the marketplace or helps maintain its stature. It’s this overlap between marketability and patentability that provides the basis for the most valuable patents— and that can have the greatest impact on market share. When there are patents involved in the key business of the company, and the company owns those patents, they are the part of the business that others can’t replicate. So the finance people can no longer calculate value as just what it would take to build up a company like yours. If you own the key technology, you become “the only game in town.” Suddenly, the value of your company multiplies! On this principle, a portfolio of patents can increase the value of a company, provided they are good patents and relevant to the core business model. Moreover, this portfolio can be a great bargaining chip if you decide to sell your company. This is a common question from investors who aren’t on TV, too! Potential investors in your idea or company will want to know that you’ve taken steps to protect your idea. To potential customers, knowing your product is patented can increase its stature in the marketplace. Often, product advertisements proudly tout that a product is patented. They do this because many consumers perceive a patent to be a “stamp of approval” from the US government. While it’s not really true that a patent indicates government approval or endorsement of a product, having a patent is often perceived as an indication that a product is innovative and exclusive. Some people seek a patent on an idea just to hang the certificate on the wall—to be able to say, “I have a patent!” There’s nothing wrong with that, but keep in mind that patents aren’t cheap. It can be pretty expensive wall art. If you’re into that, it is kind of cool to have one. And it’s definitely something to be proud of! Pursuing a patent on an invention for the sheer experience of it might be one of the best reasons to do so! For a serial inventor or fledgling serial inventor, the education you would gain just by going through the patent process may be well worth the investment of time and money. Often, when people are successful with an invention, it wasn’t their first invention or their first attempt at launching a product that found success—it was their second, or even their third! However, the first time they went through the process was a valuable experience. Yes, it’s true. When many people seeking a patent are asked why, the best reason they can give is someone told them that they should. They haven’t stopped to consider whether it’s something they actually want. “I want to patent it, so I know I can make it” is another reason I commonly hear from inventors. Unfortunately, this reasoning stems from a major misconception! In fact, patenting an invention is no guarantee that it won’t infringe other patents. This is a very important concept, so let’s talk about it right now! Having a patent does not give you the right to make a product. It gives you the right to stop others from making, using, or selling the product. There is an important difference here. 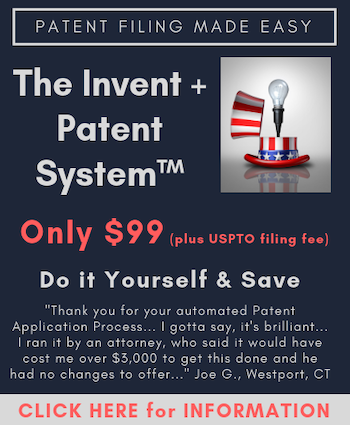 In granting you a patent on your improvements, the United States Patent and Trademark Office (USPTO, aka “the Patent Office”) does not consider whether you could actually produce your product without infringing any other patent. Thus, getting a patent is no guarantee that you are not infringing the patents of others! It pays to consider why you are applying for a patent. Knowing your reasons will help you to decide whether applying for a patent is the right decision and will shape your strategy throughout the process. For more information, please see the ABA Consumer Guide, and the companion website for the book: http://patent-book.com. Rich Goldstein manages IP boutique Goldstein Patent Law, which he founded more than 20 years ago as he was graduating law school. He is the author of recently published American Bar Association Book: The ABA Consumer Guide to Obtaining a Patent. Rich is a past chair of the AIPLA Law Practice Management Committee, and Co-Chair of the NYIPLA Law Firm Management Committee. He has served on the editorial boards and written articles for Law Practice Magazine and Law Practice Today. Rich frequently writes and speaks on topics related to law firm leadership, legal marketing, and business development. For more information, or to contact Rich, please visit his firm profile page. “Do you have a patent on this” ? To Protect New U.S. Industrial Development (based upon inventive new technology). What?! Would you presume no possibility of raising new industry, except through “licensing”; as this omission implies? This view takes no account of the inherent resistance of incumbent interests, to the prospect of disruptive and destructive forces of innovation in industry. How shall one find licensing or financing from the very companies or industry one would upset or vanquish, in the industrial and commercial development of a newly or recently invented technology? This isn’t a reasonable proposition. Especially since, such a large scale effort involving such enormous lobbying resources committed to weakening U.S. patent protections over these past some years, gives further evidence of the motivation and magnitude of said resistance. No – those new technologies finding success in their commercial adoption, have either struck existing markets “from left field” if capitalized within their own industry; or, been able to draw upon requisite developmental resources from elsewhere. There are those of us inventors would still be the next Charles Goodyear, William Stanley Jr., John Boyd Dunlop, Nicolai Tesla, etc. – and also sufficiently understand business development, to be capable of raising a company and an industry. We are not satisfied with the small minded notions of patent application, that most of these contributing authors, commentators and readers, are commonly limited to – we seemingly few of us who still work in the physical world, create new tools for the future; and are driven to manifest, as entrepreneurs, their industrialization. When the inventor-engineer is in charge, there is such a potential – something akin to a “Steve Jobs” effect; however, not merely as a cult of personality; but in the real: its implementing company benefits from the original expertise of the innovator, in driving its optimal engineering development, as its industrial capacity is built up, and its commercial adoption increased. What price do we place of opportunity cost on the loss of U.S. patent protections for classically beneficial purposes; that is supposed to empower an inventor-entrepreneur such as myself with a seminal new technology; to deliver on the brightest promises of which the Founding Fathers established patent provision in the Constitution, in the first place? While “Big Tech” incumbents routinely presume to pirate and steal inventors’ properties, whole swaths of industrial development – new value chains, new careers along with new jobs, logistics, infrastructure – are thereby starved of any reasonable opportunity for growth. If anything, Google’s own history should be yet another example of this phenomenon: a startup; which technological position was protected by two U.S. patents until it now is, without a doubt; strong enough to withstand open market competition in its industry*. So, tell me about this: why shouldn’t the very same path be available to me, as an entrepreneur – and not merely: how can I find (beg for) a licensee? Because, your emphasis as to my presumed “best interests”, together with your omission of the one truly entrepreneurial choice available; reflects to me, this mindset of a limited milieu – and the lingering effects of the milquetoast response of the patent practitioner community, to effectively having our entire Constitutional property franchise degraded nearly completely and tossed into the gutter. And, to be clear: those of us inventors who can understand legal implications loud and clear; also realize, how said patent practitioner community dropped the ball, in getting all of our collective lunch eaten alive by the efficient infringers; who took their kid gloves off, and started throwing haymakers – yet, “our side” of the issue – as trusted by the inventors you attorneys are so sure to then patronize (however ‘subtly’) – continued to play it sedately; even while getting gut-punched by their ‘brass knuckles’, over and over again. So pardon me – while actual real life inventors such as ‘angry dude’ and myself also express our positions with integrity – if what you end up reading, isn’t pretty nor very complimentary. I understand Gene’s point about naive inventor hubris, and I am certain he has seen many instances; but that does not account for those of us, who can see what the true situation is. Not every inventor, is legally naive or inept. Not every inventor, is ignorant of implications of judicial rulings. And those of us who are so capable, are not pleased with the admonitions to follow attorney advice; when: just who and what is it, that has wrought these awful changes to U.S. patent jurisprudence, due process and administrative procedures? Attorneys. What is Ms. Michelle Lee? An attorney. What are the vast majority of ‘K Street’ lobbyists working for patent destruction as so-called ‘patent reform’, as utilized quite effectively by ‘Big Tech’ and ‘Big Pharma’ in pushing through the passage of the AIA? Attorneys. So, take offense to the valid objections of genius inventors who are part and parcel of the very raison d’etre for your entire branch of the legal industry – at your collective peril. Some of us, have had far more than enough, to the point where the appearance of our assent by seeming inaction, can cause a reasonable person to presume our compliance. Be not deceived: we are beyond outraged; and there is very little basis upon which to found trust, any more. YOU want to save your industry and your careers? YOU FIX THE HARM – talking down to inventors will do nothing to raise the debate; nor, prospects of the “cause”. * – Their own backstory alone, should be adequate argument for retaining the per-AIA U.S. patent law jurisprudence. Thank you for adding your point. Sound arguments to file a patent. However, I think many start-ups & sole inventors are too focused on patenting and forget developing processes and methods to secure their innovation via trade secrets. Once you file, it’s published and out there which, in some eyes, can also be seen as a liability and risk, devaluing the value of the intangible assets. A sound strategy, which begins with actually understanding IP (both commercial and legal), should be present before filing.